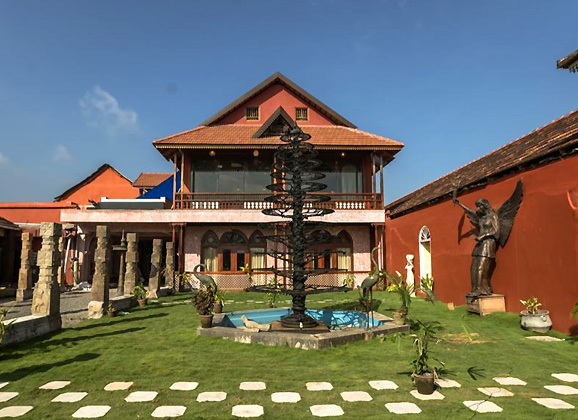 "Ginger House Museum Hotel features an architecture which would win your heart with just a glance. From its antique furnishings to the incredible paintings, every part of this property oozes out royalty just like the classic times. 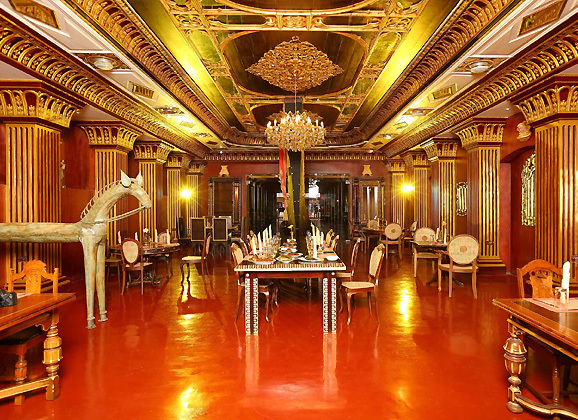 What makes the hotel stand out is definitely the lobby which features a 108 ft. long snake boat, the oldest in Kerala. Moreover, the overall setting of Ginger House is the perfect rescue from the monotony, a place you would rush to again and again for its aesthetic beauty. Majnu is not just the name behind the successful running of the Ginger Museum Hotel but a person who is a visionary for all. Starting off his career as an ordinary worker, Majnu turned his life around when he started off this hotel. His love for artifacts and heritage arts can be well seen in the well-appointed architecture. Moreover, the antiques that are present in the hotel has been something that the founder-owner holds close to his heart. The 8 rooms of Ginger Houses possesses a different vibe and a unique charm you cannot miss. Inspired by the authentic architecture styles evolved in South India, every corner of these room don a vintage aura. The air-conditioned high ceiling of the rooms is a common shared factor. While the guests also get minibars and herbal toiletries. There is something out of the box about this room dressed down with a patio, best of teakwood offering an aura of luxury. The bathroom is another attraction which is beautified by Art Deco tiles carved out of 24k Gold. What might win your heart with a click is the extensive use of teak wood in almost every part of the room. 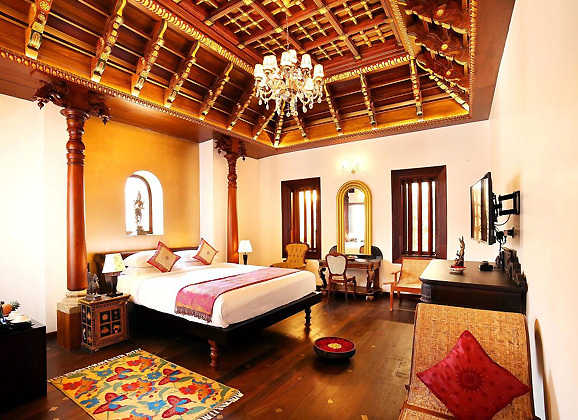 The lotus carved ceiling, the extended balcony is the main attraction of this room influenced by Kerala architecture. Even though the name seems a little twisted, this room overlooking the Vembanad Lake is one fine abode for the honeymoon couples. While the classic mirror and wood combination take up the ceiling, the furniture and bathroom fill in for the elegance. Dressed the European style, this room is a classic example of Baroque architecture. While the golden and white walls add texture, the crystal chandelier shimmers up even the dark wooden floor. The room doesn’t have to speak for itself, as the pink shaded walls, double teakwood doors, Indian chest bench, and cane furniture would fill in. The wooden vibe of this Chettinad inspired room is enough to win your heart over. If it somehow fails, then the antique pieces, granite floors, and walls walk-in shower tub will do enough justice. 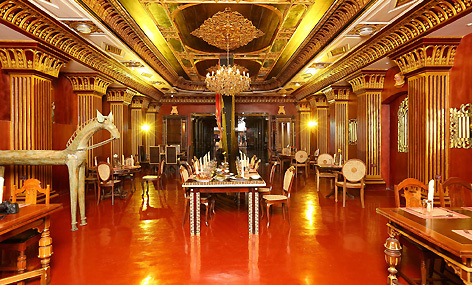 Dravidian architecture envelops the slightest corner of this room which is beautified with antique pieces. What adds a classic touch probably the “Manichithrathazhu” meaning “the ornate lock” which is attached to the door of the room. 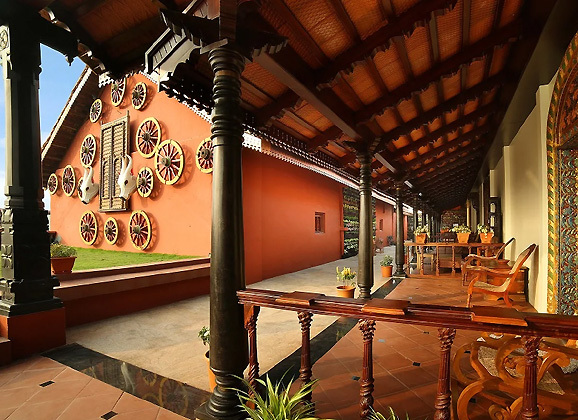 Embracing the fine Kerala architecture, what makes this room type stands apart is definitely its antique furniture. The finely carved doors and entryway ceiling are what makes this room speak excellence. After a long day of enjoying outdoor activities, the multi-cuisine restaurant at the hotel comes to the rescue. The kind of delicacies that the restaurant offers lets you savor the authentic taste of Kerala. Which is why it is called one of the best in Cochin. Cochin, cuddled by the Western Ghats on the east and the Arabian Sea on the west, is by far the most famous city of Kerala. Come here if you want to experience a mix of history, rich diversity and hues of modernization. 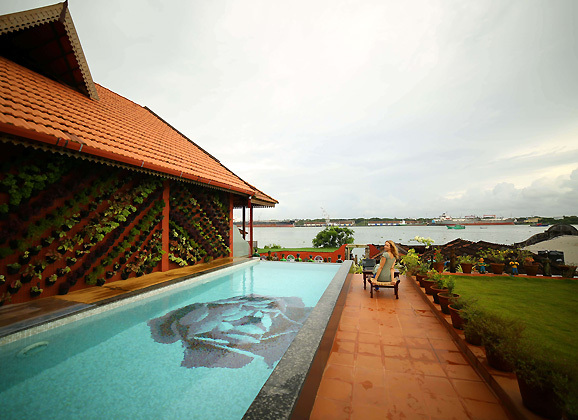 The city is fondly known for its heritage hotels, warm homestays and home to Keralan arts.